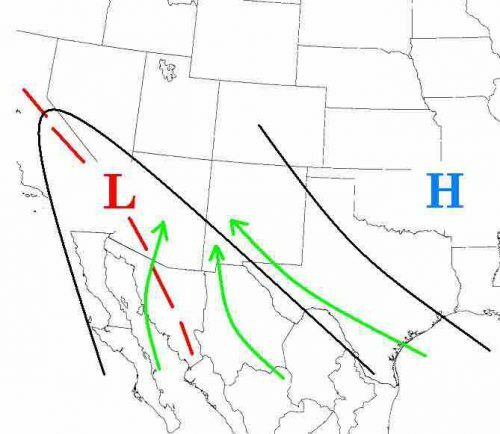 A map of the weather pattern of the North American monsoon. Westerly winds dominate across West Texas in winter and spring, but in summer the pattern shifts, allowing moist air from the Gulf of Mexico to travel inland. Temperatures linger well above 100 – the outback bustles with scorpions, rattlesnakes and tarantula hawk wasps. Summer in West Texas is fierce. But, in this arid land, it also means the happiest of prospects: rain. Between May and September, the North American monsoon brings the majority of our region’s annual precipitation. For both wildlife and human communities, life here hinges on those summer rains. And the forces that shape the monsoon are dauntingly complex. If, when and where it rains in West Texas depends on factors as distant as the South Pacific Ocean, as near at hand as mountains on the horizon. It begins, in many years, on an afternoon in May or early June. The heat is intense, and, above, cumulus clouds begin to take shape. As the days pass, sun, sky and land elaborate on the theme, and by late summer they strike crescendos, in the form of thunderstorms. Tropical storms in the Sea of Cortés can bring rain to West Texas. But the majority of our summer moisture comes from the east. Rick Hluchan is a National Weather Service meteorologist in Midland. Fronts and troughs of cold, dry air sweep off the mountains and highlands of the American West in winter and spring, keeping moisture here at bay. When that pattern ends, Gulf moisture drifts west. Then, the very local topography of West Texas comes into play. Alpine and Marfa are separated by Paisano Pass. These low mountains are sufficient to block rain-producing weather. As a result, Alpine’s average annual rainfall is higher than Marfa’s. And with drier air, Marfa’s summer nights are often cooler than Alpine’s. This “rain shadow” effect is at work elsewhere in the region. The Guadalupe Mountains can effectively block the westward flow of moisture well into mid-summer. But the contours of the monsoon are also shaped by far-flung developments. El Niño is an atmospheric phenomenon associated with warmer than average temperatures in the Pacific Ocean, off the coast of South America. La Niña is connected with cooler waters. Both affect the jet stream – the narrow, fast-flowing air current that acts as the storm track for North America. El Niño pulls the jet stream south – increasing the flow of moisture into the southern U.S., including West Texas. La Niña has the opposite effect. In 2017-2018, La Niña contributed to record snowfalls in the Northern Rockies and northern Midwest – and to West Texas’ second-driest winter on record. Few can forget the region’s driest winter. The year 2011 brought the worst single-year drought recorded in Texas. The effects – in wildfires, on the ranching industry, on wildlife and ecosystems – were profound. That drought was shaped by a phenomenon called the subtropical ridge. Each summer, air uplifted at the equator descends on the U.S. Where the ridge settles, it creates conditions that are dry and intensely hot. Typically, the ridge moves about during the summer, drawing Gulf moisture in around its edges. But it can also become locked in place over an area that’s already parched – as it did, in 2011, over Central Texas. Climate change could have long-term effects on the North American monsoon. Some climate scientists believe rains could begin later in the summer. And increasing temperatures could lead to more intense, but more isolated, rainfall. Despite a dry winter, the U.S. Climate Prediction Center projects above-normal precipitation this monsoon season. For West Texans, that’s welcome news.